I first tried the gorgeous Ravinder Bhogal’s food at her stunning restaurant in Marleybone called Jikoni, and so when I saw that she was the resident chef at W London for their eclectic dining series at their newly refurbished Perception Bar over the next few months, I was so intrigued to try the menu, more so as it was her first fully Vegan menu in homage to her niece, who gave her away during her wedding, and became a Vegan two years ago. Much like myself, Ravinder has an East African background and Indian roots, and is such a culinary genius that I knew she had something special in store with her menu. After experiencing her vegan menu she has changed my perception of Vegan food, and probably a lot of people’s perceptions of Vegan food, and what an aptly named venue to do this at! Everything down to the wine is Vegan which is amazing. 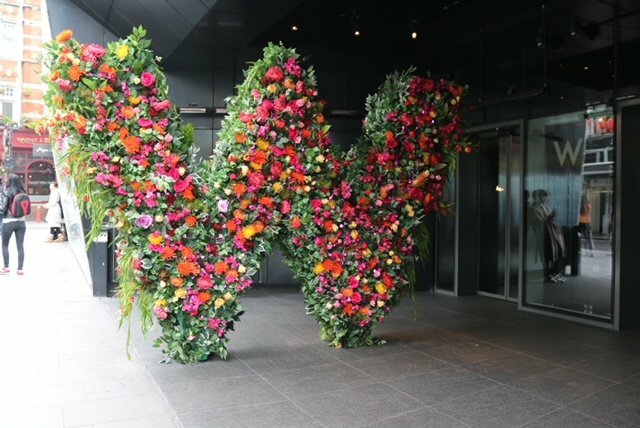 As we arrived at W London, we were greeted by their huge W sign at the entrance, which had been given a Spring upgrade and was fully covered with pretty flowers. The W London was most definitely in full bloom! The floral theme continued into the bar and lounge area, within the Perception Bar, the venue for Ravinder’s dining series, which is available every evening for dinner. Some of the flowers on the flower ball are popular East African flowers, adding to the personal touch of Ravinder’s residency at the venue. The bar itself has recently been refurbished and is such a great venue for drinks. For our welcome drink we were asked by the bartender how strong our Hayfever was, in true quirky W London style, and kicked off our experience with a Hayfever cocktail, with delicious flavours of cumin and coriander and in a vibrant green shade. The amount of pills depend on how strong your hayfever is 😉 Brilliant cocktail! The table set for our lunch was absolutely spectacular and the menu sounded absolutely divine. Luckily we didn’t have to choose anything (which would have been a tough decision as everything sounded incredible) and we luckily got to try everything in a sharing fashion. The starters included besan fritters with coconut yoghurt and curry leaf, Asian mushroom ragout with sweet potato gnocchi, Crispy beancurd and rice noodle summer rolls with a chilli and sesame sauce, Cauliflower Popcorn with Thai Basil Tempura, and a black vinegar and chilli dip, Charred sprouting broccoli and spelt with a Miso dressing and a Beetroot and Walnut Kibbeh with tahini and pickled chillies. All the dishes were so full of flavour and with such interesting ingredients, that I wouldn’t even have considered them to be vegan if I didn’t know they were. This really helped open up my mind to vegan cuisine and just how much choice there is and how you can pair it all together. My favourite dish was the cauliflower popcorn with the thai basil tempura and the very addictive accompanying dip made from black vinegar and chilli. Mains were also an amazing flavoursome selection which included Empura Inari with Moong Dhal, Sweet and Sour Tomatoes and Turmeric Carrot Kraut, Cheela filled with pumpkin and cashew curry, and served with a cabbage thoran and coconut chutney, Coconut Kari with potato, onion and pea bhajis, Caramel braised tofu served with confit garlic rice and smacked chilli cucumbers and finally sweet potato gnocchi served with Asian mushroom ragout, sweet potato crisps and crispy kale. My favourite was definitely the caramel braised tofu with confit garlic rice and smacked chilli cucumbers. It was just divine. I would definitely order it again. I also loved the Empura Inari with Moong Dhal, Sweet and Sour Tomatoes and Turmeric Carrot Kraut. I just adored all the various flavour combinations and the innovative use of ingredients in unique and creative ways. Desserts were a gorgeous trio of charred pineapple with lime, lime leaf and lemongrass sorbet served with a cashew and black pepper praline, rose, coconut and cardamom doughnuts and a saffron, mango and passionfruit raw ‘cheesecake’. Each dessert reminded me of home in their own special way – the charred pineapple bringing those tropical Indian ocean vibes, the doughnuts reminding me of nankhatai in taste and mandazi in texture, and the cheesecake was just so refreshing and reminded me of all the glorious fresh fruit we are spoiled with. They were all so delicious and incredible that it is so hard to pick a favourite and I am so happy I got to try all three. Whatever your perception is of Vegan food, leave it at the entrance of W London and step in and prepare to be amazed by the absolutely incredibly delicious menu that Ravinder has created. Trust me even as a non-vegan I was absolutely blown away and can guarantee that you will not miss meat during your meal at all. I highly recommend it. It is perfect for anyone – not just vegans!The menu is available until the end of June so book yourself in to experience it – you will definitely be in for a treat! I was invited to try the menu at W London and my meal was complimentary. All views and photos are my own. These dishes look utterly incredible! Mouthwatering!! I really wouldn’t have through about trying a vegan menu but all those dishes sound fantastic! This meal looked fab! I love vegan food.